This paper describes Lexogen, a system for generating natural-languagesentences from Lexical Conceptual Structure, an interlingualrepresentation. 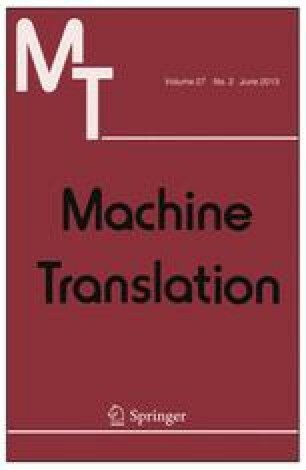 The system has been developed as part of aChinese–English Machine Translation (MT) system; however, it isdesigned to be used for many other MT language pairs and naturallanguage applications. The contributions of this work include: (1)development of a large-scale Hybrid Natural Language Generation system withlanguage-independent components; (2) enhancements to an interlingualrepresentation and associated algorithm forgeneration from ambiguous input; (3) development of an efficientreusable language-independent linearization module with a grammardescription language that can be used with other systems; (4)improvements to an earlier algorithm forhierarchically mapping thematic roles to surface positions; and (5)development of a diagnostic tool for lexicon coverage and correctnessand use of the tool for verification of English, Spanish, and Chineselexicons. An evaluation of Chinese–English translation quality showscomparable performance with a commercial translation system. Thegeneration system can also be extended to other languages and this isdemonstrated and evaluated for Spanish.